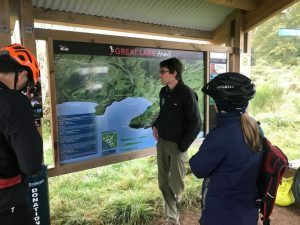 I have previously ridden the W2K Headland loop section of the Great Lake trail with my husband and kids and really enjoyed it so was looking forward to heading back with a group of friends ( minus the kids ) to do the whole trail. 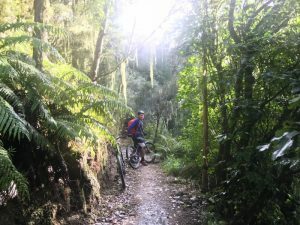 The Great Lake trail is just out of Taupo and is made up of 3 rides that go from ‘K’ place names to ‘W’ place names. I was hoping that after I had ridden the trail the names would stick in my head but they don’t. For details on the trails you can check out NZ Cycle Trails description however we rode it based on Ted from Tread Routes suggestion to ride Whangamata Rd to Kinlock ( W2K – 20km ) and then Kinloch to Whakaipo Bay ( K2W – 23km ) on the first day and then Waihaha Bridge to Waihora Stream on the second day (W2W – 30km). 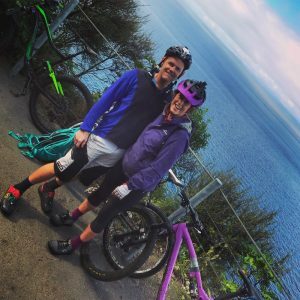 More details on the NZ Cycle trail website. 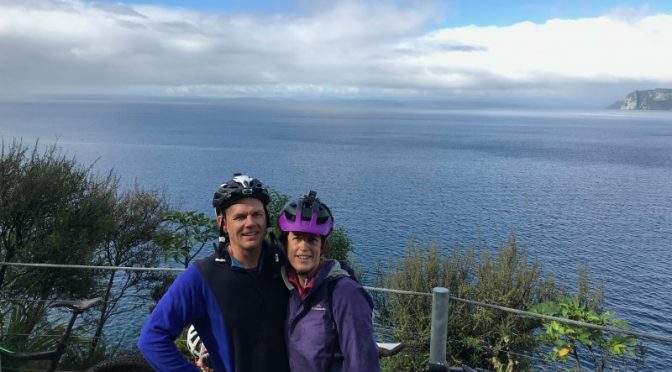 Of course, being near Taupo, there are also lots of options for places to stay but as I started researching I realised our group configuration of 3 couples and 3 singles was going to make finding a suitable bed for everyone a little more difficult. So I was delighted that one place I found happened to be right on the lake in Kinloch with a suitable bed for everyone in our group. We found basing ourselves in Kinloch did make for some easy logistics and a great lunch spot on day one…but more on that later. Day one dawned a little grey and overcast but not raining and given how wet the last few weekends had been we were happy with that. Ted from Tread Routes was super helpful with tips on the best logistics so 3 of our crew drove cars over to Whakaipo Bay, our end point for the day, while the rest of us waited and did crosswords. Ted then picked the drivers of the cars up and came back to Kinloch to collect the rest of us, and we were off to the trail. For some reason I was so into my crossword and expecting a long drive to the start of the ride I took my crossword with me – coz that’s what everyone takes on a mountain bike ride right? Anyhow it wasn’t a long drive to the start and there was far too much pre ride bantering for crosswords. Unfortunately, we did drive into light rain but that didn’t dampen our spirits as we jumped out of the van for the very informative trail briefing from Ted. The trail starts off on a slight downhill gradient which was a pleasant way to start and while it is rated as a grade 3, I would say its on the easier side of 3. The trail meandered through a wetland area and before I knew it we had done 10kms and were at Kawakawa Bay. From here we could see the headland we were riding up next and it did look a little steep. Thankfully the trail meandered up the side of the mountain and while it was a steady climb it wasn’t too difficult. From here it felt like it was all downhill into Kinloch, I’m sure it probably wasn’t but that was the impression I got. We were back in Kinloch for lunch by 11.30 after setting off about 9.30am. Now I would like to say I planned our accommodation around a good lunch stop but it didn’t dawn on me till the night before that as we were riding right passed the place we were staying in, about lunch time, we didn’t need to ride with our lunch ( there is also a café and a general store in Kinloch that does takeaways right by the trail ) Of course the one problem with stopping in at the house was leaving it again. Lucky one of my friends was focused on getting back on the trail and finishing before the rain that was forecast for later that afternoon came so we were back on the trail by 12.30. One of our friends also decided that 20km the first day was enough for her so she stayed behind to do the important job of keeping the fire burning. The next part of the trail was familiar territory as thats the leg I mentioned we had ridden the year before with the kids. It’s a steady up hill climb and once again I am amazed by what our kids can ride. Although this was familiar territory it was completely different conditions to when we had ridden in July the previous year. Its been a very wet autumn and the trail reflected this with lots of mud and decaying slippery leaves on the track which made for some interesting cornering and some skidding downhills. There is nothing like knowing there is rain forecast to keep you focused on getting to the end though and we got back to the car at Whakaipo Bay just as the rain started. Thankfully we had someone at home keeping the fire burning so we were back toasting ourselves with a well-deserved drink in front of the fire in no time. Lucky for us day two dawned bright and sunny. Ted from Tread Routes arrived at 8am and we were off again with a slightly longer drive to the start, but first a detour to the local café for coffee. After another informative trail briefing we were off alongside the Waihaha River on a trail cut into the cliff – quite a way to start the day. A lookout spot along the way gave us views over massive ravines running through the country side, quite unlike anything I have seen in New Zealand before. As we left the river behind we rode into stunning native bush and very slippery trails that I just wasn’t enjoying as much as the day before. Had I lost my mud mojo?, had too much coffee?, was I talking too much to concentrate?….finally figured out that my husband had thoughtfully pumped my tyres up a little, so after letting out some air I was whizzing through the mud again with a lot better grip. This part of the trail had some big headlands to pass over and there were a few steady uphills but with uphills comes great downhills. The views are amazing and at one point we had one of the biggest views over Lake Taupo I have ever seen. It certainly made me realise why the trail is called the Great Lake trail. At our last viewpoint and lunch spot as we looked across the lake we could see out boat coming across the lake from Kinloch – perfect timing. 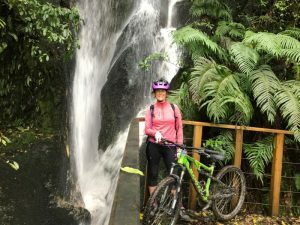 We whizzed down the last hill and were at Kotukutuku Stream after stopping to admire the waterfalls and amazing structures that have been built down through a ravine to bring riders down to the lake edge. 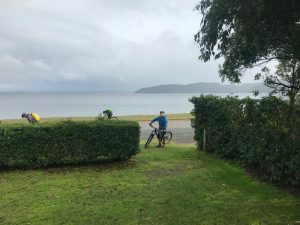 After a 30 minute boat trip we were back in Kinloch where we were dropped off at the Marina which quite conveniently has lots of hoses to wash bikes and was a 2 minute ride from the house we were staying at. 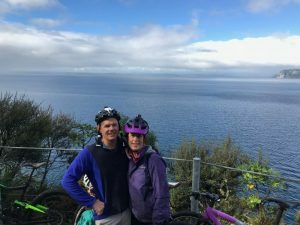 All in all we loved this ride, it’s a good grade, can be ridden in many different ways to suit ability, has stunning native bush and some spectacular views of Lake Taupo – we are already planning to go back and ride it all with the kids, maybe over 3 days. The track is 2 way and a multi-use track so we did wonder how busy it would be in summer. We rode in slippery conditions in late autumn but have previously ridden in the middle of winter when it was cold but the trail was drier so I guess you need to be prepared for anything. The trail can be ridden in many different ways; have a chat to Ted from Tread Routes about the logistics that work best for you. Basing yourself in Kinloch does make for some convenient logistics.